Common St. John’s Wort wildflowers are blooming all over Cape Cod. You can see them along the trails and roadsides. I took this photograph at Fort Hill on the side of one of the hiking trails. I loved how the sunlight caught it. They are a bushy branching plant with many 5-petaled dark yellow 1″ flowers and many prominent stamens. They grow to about 1-2 1/2 feet from June through September. 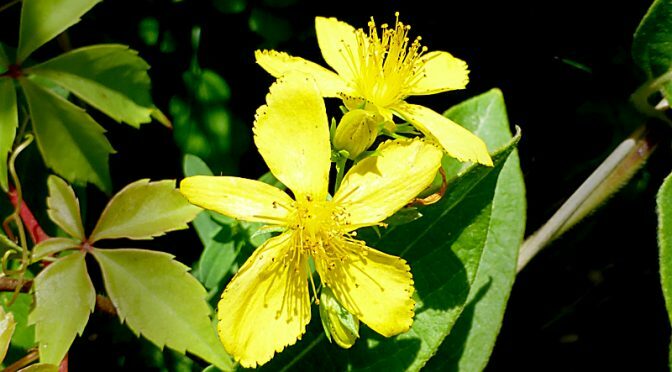 Have you ever seen a Common St. John’s Wort wildflower? Kind of like a starburst in the center. Very cheerful! And so much prettier than the capsules sold at CVS!